English: An adult Ascaris lumbricoides worm. Diagnostic characteristics: tapered ends; length 15 to 35 cm (the females tend to be the larger ones). This worm is a female, as evidenced by the size and genital girdle (the dark circular groove at bottom area of image). Français : Ascaris lumbricoides, femelle adulte. 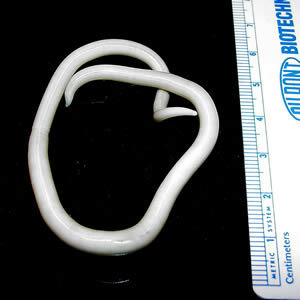 Polski: Ascaris lumbricoides. Glista ludzka. 日本語: カイチュウ (Ascaris lumbricoides) 左の目盛りは3cm. Română: Vierme Ascaris lumbricoides adult. Türkçe: Bağırsak solucanı insanlara da yerleşebilen bir parazittir. Српски / srpski: човечија глиста. Македонски: Човечка глиста, вид на цевчест црв.